The local kids are back at school and my kids are finally beginning their long 'summer' holiday. Being Australian it still feels odd to be having the main holidays in the middle of the year, with the new school year starting in September instead of January, but the school follows the Northern Hemisphere school calender so we have to adjust. It means that it is winter in Australia if we want to visit, although this is actually a pleasant change and not a problem. But this year we are finally heading to Cambodia for a week. I have been wanting to visit this beautiful country since living in the region and so this is our chance. Mum will love it too I hope, as she has become quite the intrepid traveller. 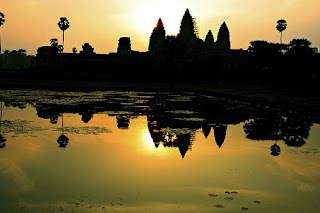 We will visit Siem Reap and Ankhor Wat and Phom Penh. I was keen to take the boat trip to Battambang which sounds like an interestng town, but the trip is just too long and uncomfortable with children. That can wait until next time. I have been reading a fascinating book called Stay Alive, My Son by Pin Yathay who was living in Phnom Penh with his family in 1975 at the time the Khmer Rouge evacuated the city and subsequently eliminated over 2 million people. His story of survival is harrowing and it will make my visit to Cambodia that much more meaningful. So I wont be near the blog for the next week, unless I can find an internet cafe somewhere. I look forward to writing about all our adventures when we return. Have a great week Singapore! I agree that it would be an interesting country to see. But sad, sometimes..